Killer whale populations could die off due, in part, to toxic chemicals. The study found that the combined PCB effects on reproduction and immune function among 10 out of the 19 whale populations studied have the potential to prevent the long-term viability of orcas. These effects were strongest in populations that lived in waters closest to highly industrialized areas, such as the Strait of Gibraltar, the UK, and the Northeast Pacific, whereas they were lowest near Antarctica, according to the study. Based on their findings, orcas face a high risk of population collapse within the next 30 to 40 years, the study authors said. And the largest declines could be around the United States, Canada, and parts of industrialized Europe and Asia, Ross said. PCBs, or polychlorinated biphenyls, are man-made chemicals that were used industrially and commercially from 1929 to 1979 — when they were banned due to their toxicity — in electrical and hydraulic equipment, paints, plastic and rubber products and more, according to the Environmental Protection Agency. 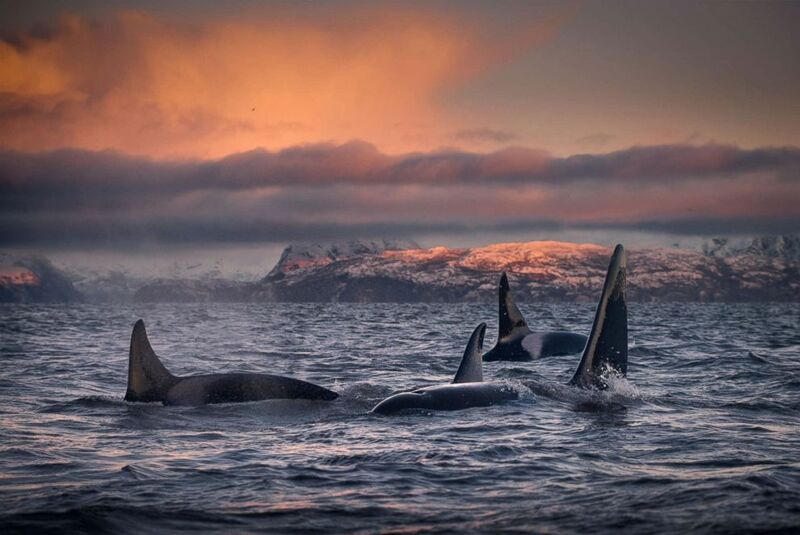 (Getty Images/Cultura RF) A pod of killer whales are seen in this undated file photo. Despite being banned decades ago, PCBs, which range in consistency from an oily substance to a waxy solid, can leak into the environment through poorly maintained hazardous waste, leaks from machinery and as vapor in the atmosphere, among other sources, the EPA states. “Killer whales once thrived in all oceans of the world, but only those in the less-contaminated waters of the Arctic and Antarctic today appear to be able to sustain growth,” read the study, published Friday in the journal Science. Exposure to PCBs affects not only whale's fertility and immune function, but other animals as well, including polar bears, according to Rune Dietz, a professor from the Department of Bioscience and Arctic Research Centre at Aarhus University, who co-authored the study. But with female killer whales only living about 60 to 70 years and having "very few calves during their lifetime," it's possible that PCBs could tip "the balance toward local population extinction," Ross said. Orcas are exposed to such high levels of PCBs in part because of their place on the food chain — they eat other animals that contain PCBs within their bodies, which ultimately accumulates to dangerous levels. But PCBs aren't the only factor that put orcas at risk for population collapse. It's likely that these combined effects contributed to the recent deaths of two killer whales. One, a southern resident calf born just 30 minutes before dying in July, was carried for more than two weeks by her mourning mother. The other, a 3-year-old southern resident named Scarlet, was last seen underweight and suffering from infections. She had gone missing and was never found. ABC News' Anthony Rivas contributed to this report.